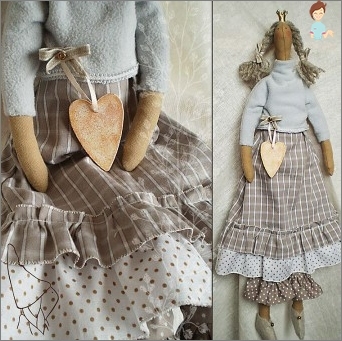 Today, the doll becomes more popularTilda, which can be used not only for the game, but also for decorating the interior. And if you make this way a housekeeper, then he will become an excellent talisman of your house, able to protect him from all bad. In addition, in the process of creativity, you can relax your soul and tune in to positive things. Do not forget that you can giveIndependently made by Tilda to his good acquaintances, and believe me - it will be an excellent presentation. And do not think that the tilde can only be in the form of little men. Not at all! You can give it the shape of all kinds of animals. The main thing in its creation is a fantasy! Yes, and colors can be original, if you decide to dye the fabric at home using natural dyes. 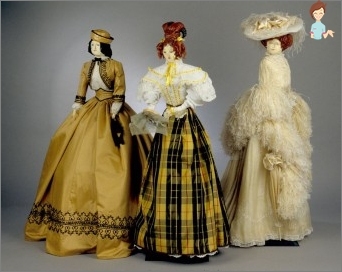 As for the history of the appearance of these amazingDolls, then, most likely, our grandmothers also created something similar in their childhood. But only in 1999 the production of Tilde was put on stream and they began to be used for decorating the room. 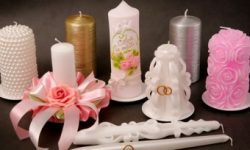 When buying such dolls for decoration purposes, you can purchase a tilde stuffed with a collection of fragrant herbs that can fill your home with pleasant fragrances. 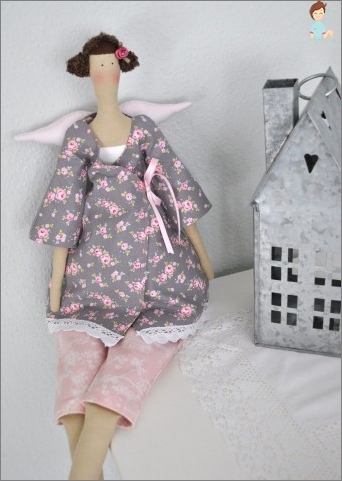 When making such a doll, keep in mind that this work requires from you a lot of work. You must carefully sew even the smallestParts. Do not forget that thin handles and legs also need to be filled with sintepon, and then carefully sewed. Pay attention to the seam, which traditionally passes through the center of the face. Try to make the halves of the head equal, otherwise the face will look asymmetrical. If we talk about clothes, then it is usually sewn to the body. Do this very carefully, so that the seamsNebyli visible to the outside eye. If you want your doll to sit, then it's worth making a few stitches under the knee. 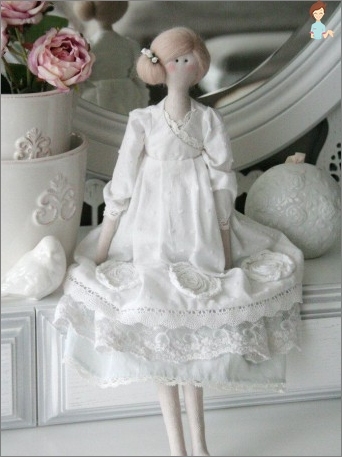 In this case, the doll's posture will not look strained. As for the seams, all parts of Tilda needSew with a hidden seam so that it looks solid. 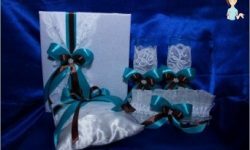 And as we said, in order for Tilda not only to decorate your interior, but flavored it, you can put in the middle of a special sachet with aromatic herbs. Moreover, you can add finely-dispersed cinnamon or vanillin to the stuffing. You can fill Tilda with sea salt. But before mixing it with a filler, it is worth it to aromatize. To do this, you can simply add a few drops of essential oil to the salt. Another variant of aromatization is the addition of a small amount of crushed mint, balm and other aromatic herbs to sea salt. One of the features of making these pupae is the light brown color of the details. Unfortunately, it is with him most often ariseDifficulties, because pick the right shade is quite difficult. And so today we will talk about how to paint the fabric in the right shade at home. And now we will consider the technology of coloring with the help of the presented ingredients. In the method of painting tea there is nothing complicated. First of all, in this case, you need to weld a special solution. To do this you will need an enamel saucepan, a few spoonfuls of brewed black tea and cold water. Pour cold water into a saucepan. There we pour a few spoonfuls of tea. Attention! The amount of tea will depend directly on what color you want to get in the end. Water with tea put on the fire and bring to a boil. At the same time, be careful not to boil too much water, because in this case you will not have anything to paint the fabric. After the solution is ready to filterIt through a two- or three-layer gauze. In the resulting liquid, add a little salt. This is done to ensure that the natural dyes are absorbed more strongly and are practically not washed out. Painting our future Tilda, you need the following way: just dip the fabric into the water and boil in the solution for an hour and a half. Attention! In the process of boiling do not forget periodicallyStir the fabric so that it does not stain with stains. And one more thing: never dry the fabric in an upright position, because spots are clearly formed at the point of contact of the fabric with a rope or clothespins. Before starting to dye the fabric for TildaIn this way, remember that the doll after such a procedure, most likely, will smell coffee. Give your Tilde the color of light tan can be prepared by making a solution of coffee, which should be applied to the fabric with a conventional brush. In half a glass of water, we dissolve from three toFive spoons of ground coffee. Attention! Coffee should be natural, not soluble, because otherwise it will be almost impossible to predict the color of the fabric. By the way, if you wish, you can add half a teaspoon of vanillin in this solution to make the fabric even more refined and multifaceted. Also, pay attention to the fact that the solution must be carefully filtered before use, since dark brown spots or stains may appear on the fabric from the lumps of coffee. In order for the fabric to be painted evenly, be sure to wash it thoroughly before staining with soap. Before painting the fabric, it is better to completelyForm all parts of the body of Tilde. If the color is too saturated, then you can simply squeeze the part with a wet cloth or gauze. And then all the extra color will remain on it. And another nuance: when drying, try to do so that the fabric does not come into contact with other surfaces, because in places of contact, the color will be less saturated. If you need to paint some details of your Tilde's outfit in an emerald color, then for this you can use a greenie. In this case, you just need to mix a few drops of warm water and drop it into the desired piece of tissue. The color will depend on the concentration of the green in the water and the duration of the staining. The color in this case is quite pleasant. Fashion for a note: In the same way you can paint and sneakers from the fabric. Attention! Remember that you do not need to paint all the shoes, but only the rag part. Therefore, lower them into the water with the greens horizontally, trying to keep the sole from touching the water. If the edge is slightly colored, then it can be corrected with a small amount of liquid to remove the varnish. And one more thing: if you hold them in the water for a few seconds, they will become rather gentle. But if you keep them for about ten minutes, then the fabric will be dark emerald. As you can see, today we figured out what you can doDye the fabric at home. In this case, remember that the color saturation with this coloring depends on the concentration of coloring substances in the water, and on the time of soaking. 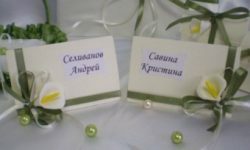 So, perhaps, at first you should experiment on small pieces of fabric, which in case of unsuccessful painting will not be a pity to throw.